My Christmas is now perfect. Sporty is the connoisseur’s choice for sure. You must be excited about the Spice Girls Reunion Tour!! I think it’s great, even without Victoria. She could never sing, so she matters the least. She was just a face. She also doesn’t need the money. She has been more successful outside of the group than in it. You’re a strange animal, that’s what I know. I never denied being a strange animal! And I identified more with Gowan than the scientists or hunters in that video. I like Blur, Bryan Adams, and Aaron too! Hooray it arrived! I’m glad you dig. As it turns out, Gowan CDs are harder to find than they ought to be. But as you say, I am on the case! Still need to find you Great Dirty World. Do you have …But You Can Call Me Larry? Anyway. Haha yes I did remember you liked Sporty, I just threw that in as a lark. And she’s totally yakuza. Look at her. LOOK AT HER! Hahaha Enjoy Dude! Nope these are the ONLY TWO GOWAN ALBUMS I HAVE!! I’m so happy right now. I love Gowan. Always have, which caught ire from my friends when I was young; not sure why? He’s talented, and I always knew it. I recently acquired Great Dirty World on CD – found it at a VV…I was excited about it since I had it on cassette (13th birthday gift!). Aaron is THE BEST. 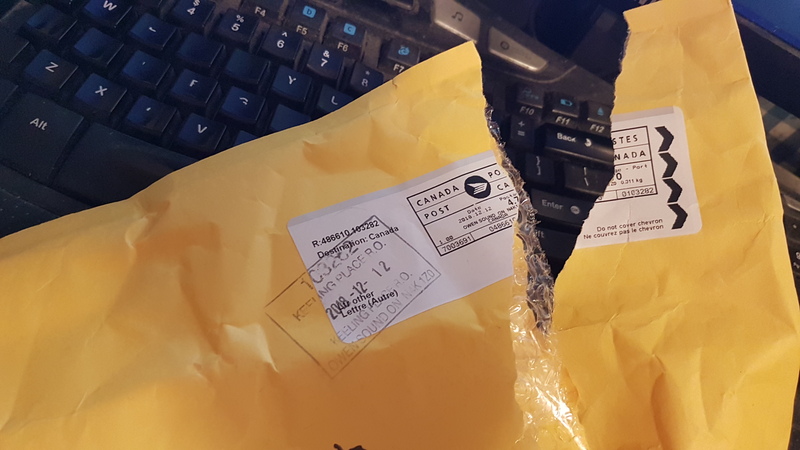 His packages arrive when you least expect it, and when you most need a friend’s connection. I hope to meet him in person some day soon (and you too!). He is so thoughtful and mindful. I have to agree, Sporty is the most musically talent of the Spice Girls, even if she did play with Bryan Adams. Sounds like you’re going to have a good Christmas after all. The wife had her 40th birthday yesterday and had a wonderful night. Me? I GOT LOBSTER AGAIN!!!! Wish that young whipper snapper a happy birthday from me. But please tell her to stay off my lawn. MR BOOKS IS SOLID GOLD! Like a gold record, man. Also man, I’m looking at the super-flattering pic of me and it’s weird. The beard is gone, and so are 20 lbs! Awww. I liked the beard. Great on the 20 lbs!! From Mr. Books to Mr. Beard to Mr. Books again. Because of smooches, Bop. Yup. Sporty Spice is from my hometown. This makes me very happy to know as a fact, the only other famous person from Whiston is Steven Gerrard, heady stuff. I am thrilled to know this! Have you ever seen her around? I am not sure I would have recognized her. I moved in the 90’s and am rarely there now. All the Gowans? Count me out :p Ginger Spice for me, I guess. Do you remember back in the 90s, some people called Ginger “Old Spice” because they assumed she lied about her age. Another comment: Sporty Spice was my favourite too. Mel C is the most honest and down-to-earth. The one person who literally starved for her success. She is the best singer with the most talent. Merry Christmas to you Mike and your wife! Hope it’s a merry one!